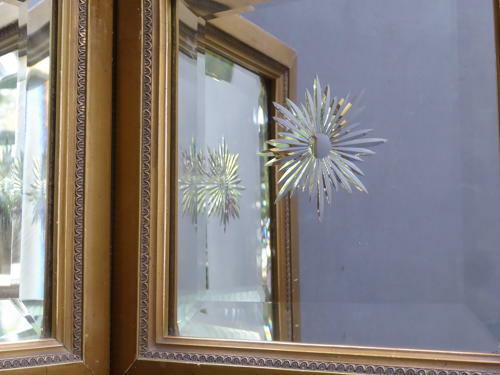 A beautiful & very unusual pair of antique cut glass mirrors. A wonderful pair of the highest quality, the thick glass mirror plates with deep bevelled edges & reverse cut & ground starburst designs to the centres. In their original gilt frames with subtle detailing & delicate beading to the outer edge with both mirrors retaining their original makers labels for Aldous & Co of Rampant Horse Lane, Norwich. Absolutely stunning. Excellent unrestored condition with some extremely minor losses to the beading on the frames, plates in excellent order for mirrors of this age (in total there are only about three 1mm beads missing so irrelevant once hung! ).